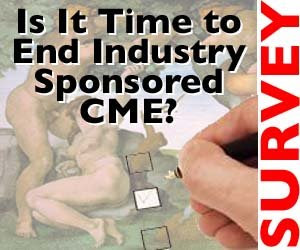 Pharma Marketing Blog: Is it time to end pharma sponsored CME? Is it time to end pharma sponsored CME? In 2006, the pharmaceutical industry provided $1.19 billion to sponsor physician continuing medical education (CME) programs in the US ($1.44 billion if you include advertising and exhibits at CME events). See "Online CME Pharma Growth is Bad News for Marketers" for the data. Why can’t physicians pay for their CME like many other professionals do? Why should pharma contribute so much for CME? Doesn't that naturally lead to biased content? Shouldn't there be a ban on commercially-funded accredited CME? Turns out that that last option has received a lot of serious consideration from medical associations, medical schools, and, of course, Congress. The latter spooked ACCME (Accreditation Council for Continuing Medical Education, which polices CME in the US) to such a degree that it also called for the elimination of commercial support of continuing medical education. ACCME, however, also proposed a "new paradigm" for industry support of CME (see the proposal here). PhRMA's New Code on Interactions with Healthcare Professionals merely puts limits on what pharma sponsors can pay for (no meals or lodging for docs) and says that funding decisions within the sponsoring company should be separate from marketing decisions (see recent Pharma Marketing News article). In July, 2008, Pfizer announced that it will no longer back CME courses provided by for-profit, third-party companies. It will keep paying for courses offered by med schools, teaching hospitals and medical societies, though. More recently (September, 2008), in a JAMA Commentary, Arnold S. Relman, MD, Department of Medicine, Brigham and Women's Hospital, said: "It is time for the leadership of the medical profession to make clear to an increasingly skeptical public that physicians, and not the pharmaceutical industry, are in charge of the education of physicians." Referring to single-company sponsored CME, do you believe it is strongly biased in favor of the sponsor's product(s)? Are ACCME guidelines regarding "firewalls" between the commercial and educational interests of a CME provider are effective in preventing bias in pharma-sponsored CME? 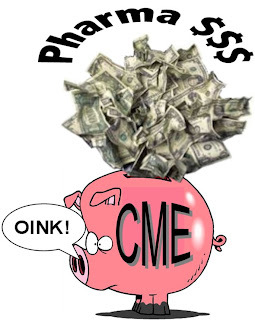 Should pharma-sponsored CME be eliminated or greatly reduced and other means found for paying to develop CME (eg, direct payment by physicians, government grants, private foundation grants, etc.)? Is industry sponsorship of CME is vital to the improvement of medical outcomes? Is the best way for pharmaceutical companies to sponsor CME is through block grants made to medical schools and/or professional societies? Please take 2 minutes to answer this survey (click here) relating to industry sponsorship of FREE, ACCME accredited continuing medical education (CME) for physicians. Results of this survey will be used to inform an ongoing Pharma Marketing Roundtable discussion, which you may join. This discussion and survey results will be summarized in the October, 2008, issue of Pharma Marketing News. Your comments are confidential (anonymous) unless you specifically provide your contact information at the end of the survey and allow us to attribute comments to you personally. After taking the survey, you will be able to view a summary of de-identifed results to date. Click here) to take the survey.